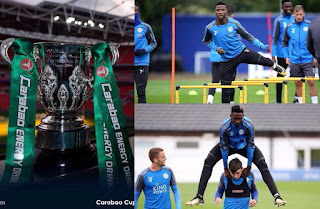 Nigeria’s trio of Kelechi Iheanacho, Wilfred Ndidi and Ahmed Musa will prepare for a tricky match in the Second Round of the Carabao Cup (formally known as the English Football League Cup) when they travel with Leicester City to Bramall Lane to face Sheffield United, a second tier side in England, Completesportsnigeria.com reports. The trio are expected to make the matchday squad for the Foxes who travel to the Emirates to face Arsenal in the opening game of the 2017 English Premier League season on Friday. Leicester City who finished 12th last season in the EPL table also crashed out the same competition in the Third Round last year to Chelsea at the King Power Stadium. Craig Shakespeare’s men will take on the Blades in the week commencing Monday 21 August it was also announced during the draw on Thursday night..